The most popular Kissimmee activities sit just a short drive from our hotel near Magic Kingdom, allowing you easy access to some of the area’s most exciting all-ages attractions. If your family is looking for a fun-filled destination, consider a stay at Maingate Lakeside Resort. Our hotel near Disney, FL is filled with family fun. Orlando’s best factory outlet shopping can be found at the Lake Buena Vista Factory Stores in nearby Lake Buena Vista. Over 400 Designer & Name Brands within 50 Spacious Outlet Shops & Complimentary Shuttle Service, pick up the shuttle schedule at our Guest Service Desk. Other superb shopping options in the area include the Premium Outlet Stores, Prime Outlet Stores, Mall at Millenia and the Florida Mall. Old Town is a Kissimmee tradition, a year-round attraction that provides standout dining, shopping, car and bike cruises, go-karts and carnival rides. Check the Kissimmee calendar of events to stay up-to-date on upcoming shows at Old Town. Another premier Kissimmee attraction is the Silver Spurs Arena, which hosts events like the Silver Spurs Rodeo, concerts and Osceola County Fair. Kissimmee’s year-round warmth makes it a perfect destination for golfers of all skill levels. The town is full of golf options, ranging from exclusive private links to affordable public courses. Try out the Mystic Dunes, Falcons Fire, Celebration Golf Resort, Bonnet Creek Golf Club, Lake Buena Vista Golf Club and Orange County International. 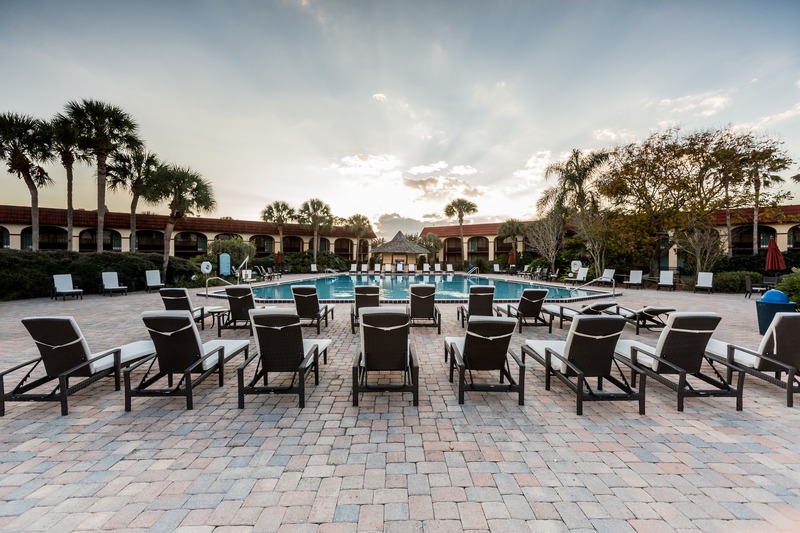 The ESPN Wide World of Sports, located just minutes from our hotel, hosts a number of top USSSA Baseball tournaments and premiere AAU Basketball events, making Maingate Lakeside Resort a great place for groups to book room blocks. Some of the best restaurants in the Orlando area are within easy reach of Maingate Lakeside Resort. Bonefish Grill serves delectable seafood, Miller Ales House provides a relaxing atmosphere and hearty dishes, Bahama Breeze, Shula Burger, Red Lobster, Chuy’s Mexican Restaurant, Olive Garden, Texas Roadhouse, and Longhorn’s is a great place to find a perfectly prepared meals. All within walking distance of the Resort and there are so many casual and fast food choices like Wendy’s, Taco Bell, IHOP, Denny’s, Golden Corral, Cracker Barrel, Taste of China, Pollo Tropical, Burger King, CiCi’s Pizza and McDonald’s. Orlando is home to some of the top museums in the south, including the Orlando Museum of Art and the Mennello Museum. Bring the whole family along on an educational adventure to Central Florida. The Citrus League, which includes half of the teams in Major League Baseball, plays its Spring Training games in and around the Orlando area. Kissimmee is home to the Houston Astros for Spring Training and ESPN Wide World of Sports is home to the Atlanta Braves during spring training. The preseason action offers a chance to see the stars of today and tomorrow during relaxed competition between rivals each March at reasonable prices. Stay for a week and see a wide range of different squads all in one place! Orlando is home to one of the NBA’s most successful franchises, the Magic. The Magic play their home games in the middle of downtown Orlando at the Amway Center, just a short drive from our resort. Orlando City Soccer Club is an American professional soccer team based in Orlando, Florida that competes in the Eastern Conference of Major League Soccer (MLS). Orlando City SC became the league’s 21st franchise on November 19, 2013. The team’s expansion rights were purchased by Brazilian businessman Flávio Augusto da Silva andPhil Rawlins, owners of the USL Pro Orlando City Soccer Club. The club began playing in the 2015 MLS season alongside the twentieth franchise New York City FC. Orlando City SC is the first MLS franchise located in the state of Florida since the Miami Fusion F.C. andTampa Bay Mutiny were folded by the MLS following the 2001 Major League Soccer season. A dinner show provides a great way to entertain and feed the family. Among the area’s dinner shows are the Medieval Times show, and Pirate’s Dinner Adventure, each serving unique food and unforgettable entertainment. You can see a piece of American history in action when you visit Kennedy Space Center, NASA’s gateway from America to the rest of the universe. The center has been the launch for every U.S. human space flight since 1968. And though it is no longer active, it’s still an amazing place to visit. Two of the world’s most legendary racing events occur just east of the Orlando area at the Daytona International Speedway. The Daytona 500 and the Coke Zero 400 are two of the top NASCAR Sprint Cup Series races—a trip to Florida for a Daytona 500 or Coke Zero 400 weekend is a trip that will stand out even for the most experienced sports fan! Find out more about what to do on your Florida vacation by reading about our favorite area attractions, visting our calendar of events or the Kissimmee Website. Head to our resort in Orlando near Disney World for a plethora of family fun.